February 27, 2017, 7:11 AM · Musicians juggle rhythm, harmony and melody routinely. That doesn’t mean that it ever gets easier. They just get better at it. 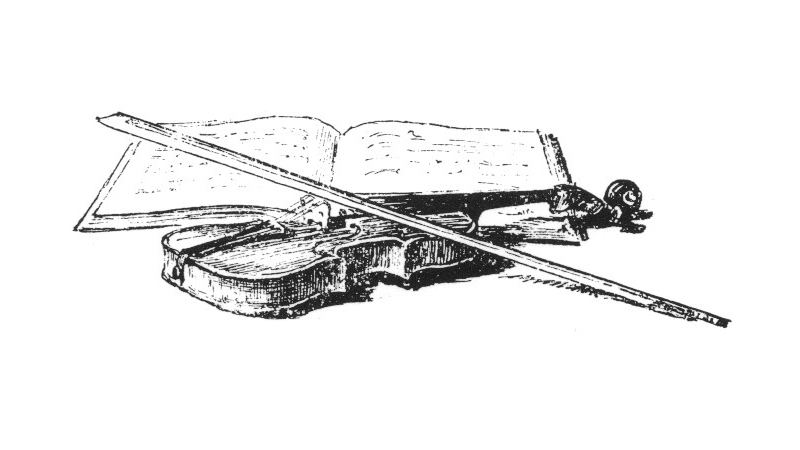 Violinists have several more plates in the air: bow arms that more often go where they’re not supposed to go, and sound production much more difficult than what pianists deal with. Bow distribution adds so much complexity that some violinists throw up their hands and play everything in only one part of the bow, usually the wrong part. So why would anyone add memorization to the mix? I may sound like a musical pessimist, but identifying the difficulties in music has become a hobby of mine. Others over-simplify. When you hear numerous players with technique to burn who have difficulty in learning flexibility, both in sound and rhythm, you realize the nature of the obstacles that words have a hard time describing. Bach famously said that music isn’t that hard; it’s just a matter of getting the right notes at the right time. (This is the earliest recorded example of a musician being a smart-aleck.) It’s also just a matter of overcoming each obstacle, one at a time. Robert Jourdain, the author of Music, the Brain, and Ecstasy, wrote about the depth and complexity of each part of music that we may take for granted. “It is often said that rhythm is music’s most ‘natural’ aspect, that it comes to music from pulsations we find in our bodies. This is one of those observations that, like the flatness of the earth, is blatantly obvious and blatantly wrong.” No sugar-coating here!! Mr. Jourdain’s honesty and insight come as welcome relief to anyone who has taken on music and instrument as a personal, life-long challenge. There is an inherent difficulty in the act of making music, no matter how talented a person is. The tools we are given by our teachers to improve can never replace the act of teaching ourselves. Given our ultimate desire to exactly re-create what is in our ears, even as they get more highly developed, I wonder why this amazing pursuit that can sustain a lifetime should by hampered by the added burden of memorizing. The obligation to memorize at an early age is inherently tied to the act of playing by ear. Children who are taught first to play music before learning to read it must play by memory. Therefore, one would assume that eventually, once music is read from the page, the memorization would not be necessary. Yet, the same process can continue for several years, and possibly at an early stage in the child’s development, the brain can become so used to playing be ear, that the child may unconsciously avoid reading at all costs. What is sacrificed by putting off reading music and requiring memorization for all recital performances? The child spends too much energy worrying about having a memory slip during a performance, rather than experiencing the full benefits of absorbing and expressing the music. If only a tiny percentage of soloists must memorize concerti and solo pieces, why would it be necessary to inflict such a requirement on someone performing during the their first year of lessons? Fear of memorization and the accompanying stage fright could be avoided by teaching the student to read as soon as he starts playing. Some kids will be better at reading than others, and others will be better at playing by ear. The balance between these two will work themselves out, as long as they are both worked on. Try to improve the part that is weaker, so that reading and listening become evenly distributed. Children have a better chance of being musically well rounded if they learn music like they learn to read. School teachers don’t ask them to memorize a book, because it’s not necessary. Just as it is a natural process to teach a child to read the words that correspond to things he knows, the correlation to music is similar. Most children readily absorb simple melodies, so reading notes is the next obvious step. The mind stores things in odd ways. Our musical parts are designed to interact, but sometimes appear to conflict with each other. Reading and listening are apples and oranges. They exist in tandem, and will continue to improve because of their relationship to each other. Discussion: Memory Slip - a do or die situation? Does it matter? Vote: To Memorize, or Not to Memorize? February 27, 2017 at 09:21 PM · I am a recently returned to playing (violin) student. Even when I was younger, I was unable to memorize entire pieces. My current teacher is flabbergasted that I'm unable to memorize entire sections - I end up merging different phrases together, resulting in a new piece of music! Oops! To play in front of an audience without that visual reminder puts me into paroxysms of panic. February 27, 2017 at 09:40 PM · Whether to memorize or not seems quite a different question than whether a youngster should initially learn new pieces primarily by ear or by reading. A student of the violin needs both! One is not intrinsically easier than the other. If the child also studies piano then they're going to become good readers because (sight) reading is a much higher priority for piano teachers in my experience. I don't want to mischaracterize Paul's thesis here, but I don't agree that memorization is the same thing as playing by ear because if one has learned the music from the printed page, then one carries quite a bit of visual memory along for the ride -- knowing where you are means knowing that you're approaching a page turn, for example. February 27, 2017 at 11:10 PM · I certainly agree with you, Paul, that memorization is not the same thing as playing by ear. The case I was presenting is that, since some children are not taught to read music for some time, they have to play pieces by memory. I'm interested to hear more about why piano teachers give more reading opportunities than violin teachers. I never thought about that. Can you elaborate? February 27, 2017 at 11:30 PM · At least in Suzuki pedagogy, one reason for starting students by rote is that the violin requires so much attention to position, intonation and tone production, it's a distraction to add music reading into that mix. You learn to speak before you learn to read words; likewise you learn the fundamentals of how to play before pairing it with reading music. February 28, 2017 at 02:53 AM · Memorization is necessary for performing solo and duet music. However, memorization is not necessary for chamber music (3+), orchestra and other non-memory gigs. Memorization is absolutely necessary if you play a style of music where sheet music is scarcely used or if you have a disability that prevents you from reading and playing at once. February 28, 2017 at 10:35 AM · Interesting thoughts above. Our DD 9, just did her grade 5 violin exams and played all her 3 pieces, and scales from memory. Certainly kept me on the edge while she seemed at ease with it. My son's piano teacher insists he reads the music or looks at the music even when he has memorised the pieces. February 28, 2017 at 11:10 AM · Memorization is also important for difficult passages in orchestra or chamber music. February 28, 2017 at 12:50 PM · I think one of the important points, explicit in the article is "Some kids will be better at reading than others, and others will be better at playing by ear". My daughter is one of the former: she got almost totally becalmed when she was younger somewhere towards the end of Suzuki Book 1. Only when her teacher decided in frustration to put the music in front of her so that something constructive could happen in the lesson, did the realisation come that that was her way of working. Once she had grasped the music off the written page she could easily go on to memorising it: the same teacher now regularly comments how quickly she memorises the much more complicated repertoire of Book 8. I suspect the Suzuki method's fixation with memorisation is not about continuing the early approach of playing by ear, it is to ensure students focus totally on their playing without their brain being partly taken up with interpreting the written score. And presumably that is also why virtuoso soloists play their difficult concerto parts from memory, though nowadays there might also be a sense that if they didn't do what the audience has seen other soloists do they might be thought somehow inferior. February 28, 2017 at 06:44 PM · Suzuki students who are truly taught by ear from the very beginning do not worry about memory slips at all during performance. As a Suzuki teacher who grew up as a traditional student, I am amazed by this. I also feel that the only way to truly focus on what you are doing with the bow is to play by memory, so I work to have my traditionally trained transfer students memorize, as well. Besides, many school solo contests, etc. require memorization, so it is a great benefit to your students to have experience with it. February 28, 2017 at 09:56 PM · I think memorization is useful so the students aren't looking at the music and therefore able to look at the bow and fingers of they are using tapes. Suzuki kids also don't seem to have a problem memorizing and reading when the time comes to read. March 1, 2017 at 04:01 AM · Paul Stein makes a good point when he suggests, "The child spends too much energy worrying about having a memory slip during a performance, rather than experiencing the full benefits of absorbing and expressing the music." Undoubtedly true for many students, depending on their memory and how important it is that they play without the score in front of them. On the other hand, I had a piano teacher many years ago who felt that you never really knew a (classical) piece until you could play it from memory, at half speed! In recent years I have taken up the violin, and I actually feel more relaxed at a student recital if I have a piece memorized, so that I can focus on the other things Paul mentioned and less on what the notes are. My teacher doesn't require memorization, and the pieces I play are fairly short, and I do have the score in front of me if needed, but the number of times I need to practice a piece results in its being memorized, or almost memorized, without my making a special effort. March 1, 2017 at 09:44 PM · Both are necessary. When practicing our brain is memorizing....with our ear, our muscles, surroundings and more.. So in a sense everything is needed.. But having the music in front of you gives a sense of confidence and ease of mind. March 1, 2017 at 10:55 PM · I'm old enough to remember soloists playing with a music stand. Yes, there were a lot of soloists who had the music memorized but nobody looked down on the musician who had the music in front of them. Like Pamela, I manage to memorize mistakes so I don't try to memorize entire works. Practice does make me familiar enough to be able to look up occasionally playing duets but I still have the music in front of me. Printed music is just another tool. All that being said, none of us will stem the tide that drives more towards memorization. I guess, one day, we'll see some orchestra assume their chairs minus music desks with everyone playing from memory. People will cheer and it may become the new standard with nobody asking: Why? March 2, 2017 at 01:32 PM · I learned to read music as a child but then didn't play any instrument for almost 5 decades. When I decided to take up the violin I started with a teacher. Although we used Suzuki material I was introduced to an improvised form of tablature from the beginning. Although we transitioned to conventional sheet music within a short time we still speak tablature during lessons, i.e. low-two, high-three, etc. as I am still learning the keys. In my case the "fear of losing my place" is overstated. I find memorization effortless and liberating. Once a piece is memorized I feel much freer to be expressive. That is when it begins to sound like music for me. However, If I stop playing a piece I don't retain it very long but I find that it "comes back to me quickly". There is an interesting point to be explored. When an advanced musician is practicing a difficult part what exactly is happening? I suspect that the mechanics are being memorized. Something as simple as throwing or catching a ball can't be done consciously. Although this is a different thing than memorization they are related. Performing an articulation with the bow is something "we just do" without thinking about it once it is learned. Memorizing how to play difficult phrases or memorizing all of a piece are more a matter of degree than of different skills I suspect, but then how our brains work is not something I claim any expertise in. March 2, 2017 at 06:50 PM · I often hear people say that musicians who play by memory feel the music at a deeper level. I think that level is reached with or without the music on the stand because of numerous other reasons: tonal purity,finding the right rhythmic pace, achieving the right blend between the pitch and the sound, taking the ego and histrionics out of one's playing, etc. The very deepest level can be achieved by imagining what musical possibilities can exist within a conventional framework. To think that these things can be achieved by playing by memory gives too much credit to memorization, merely one element of the music making process(an element that has the significant potential of undermining one's confidence and playing). I prefer giving more credit to the importance of all the factors that go into playing a deeper level. Some people insist on memorization as if it's a dogma, rather than a choice. As if it's not enough to memorize concerti, they include sonatas and even chamber music. When a personal choice becomes a dogma that affects other people and creates unreasonable expectations, it no longer feels like a musical choice. It takes on a different kind of tone, one of unnecessary hardship.